THE AGE LIMIT for all forms of gambling is to be set at 18 years old under new legislation due to be published in the coming days. Cabinet approved the Courts and Civil Liabilities (Miscellaneous Provisions) Bill today, which provide a series of amendments to provide, in the main, modernisation of the Gaming and Lotteries Act 1956. The Act currently regulates gaming at carnivals, circuses, amusement halls, arcades, funfairs, as well as lotteries and raffles at sporting and entertainment events. Under current legislation you cannot buy a Lotto ticket or make a bet until you are 18 years of age, and it is also an offence for a child under the age 18 to be in a bookmakers. However, currently under the Gaming and Lotteries Act 1956 those aged 16 can enter an amusement hall or arcade which may contain slot-machines. 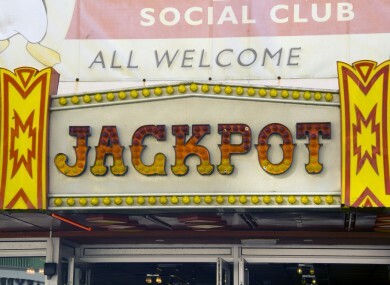 This Bill will also introduce a new part to the 1956 Act bringing clarity to the area governing sporting club lottos and raffles, increase the stakes and prize pot limits, as well as introducing a uniform age limit for gambling to be set at 18 years. In a recent interview with the Irish Independent, Minister of State for Justice David Stanton, said he had concerns that local lotteries and raffles were acting without proper authority and regulation. Under the current law, a permit must be issued by a Garda superintendent for weekly lotteries up to €5,000. Prize pots up to €30,000 must get a licence from the District Court. However, the minister said that many are flouting the law due to lack of awareness surrounding the laws, with many breaching the prize limits allowed. It’s understood the prize limits, as mentioned above, will now be increased. This legislation is just an early measure being introduced by the minister ahead of more comprehensive laws aimed at gambling control. Stanton is currently preparing legislation for an independent regulatory authority for the entire gambling industry. One of the more interesting aspects expected to be included in that Bill is the principle of self-exclusion – where someone suffering from gambling addiction for differing reasons can request of an individual establishment, or all such gambling shops in a specific area, to refuse to allow them gamble for a set period of time – usually between six months and five years. The Bill has been delayed for an extended period of time due to ‘complexities’ in its implementation, however the Taoiseach Leo Varadkar said the heads of the Bill are due to be introduced in the next Dáil session. “This is an important issue. It is also important the Government puts in place a proper regulatory structure around gambling, both to regulate an industry from which many people get much pleasure but also one which gives rise to people becoming addicted, impoverished and unwell as a consequence. Legislation in this area is long overdue,” said Varadkar. Email “Minimum age limit for all forms of gambling to be set at 18”. Feedback on “Minimum age limit for all forms of gambling to be set at 18”.